This is a character, three bedroom, two bathroom, two level completely renovated, penthouse apartment with a large roof top deck. Lots of mid century era features including railings, refinished hardwood floors, massive rooms,a curved feature wall, jewel box corner display and a shower ensuite. Upper bedrooms make a great office with library wall and direct access to the deck. Super location convenient to shops, transportation, the hospital, downtown and all that the city has to offer. YOU'LL LOVE IT! Please visit our Open House at 3590 23RD AVE W in Vancouver. 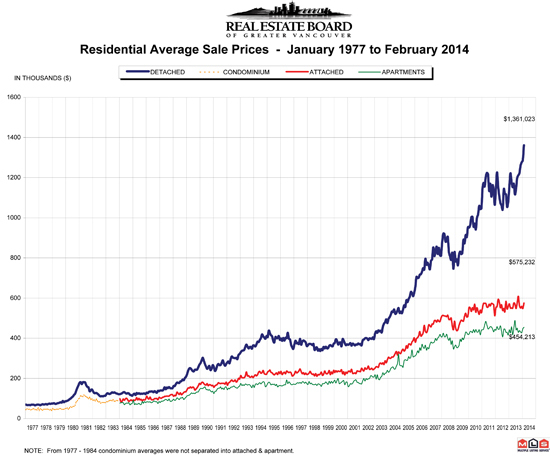 VANCOUVER, BC – March 4, 2014 – In the first two months of 2014, the Greater Vancouver housing market has maintained the steady pace set throughout 2013. The Real Estate Board of Greater Vancouver (REBGV) reports that residential property sales in Greater Vancouver reached 2,530 on the Multiple Listing Service® (MLS®) in February 2014. This represents a 40.8 percent increase compared to the 1,797 sales recorded in February 2013, and a 43.8 percent increase compared to the 1,760 sales in January 2014. The sales-to-active-listings ratio currently sits at 18.9 percent in Greater Vancouver, a 4.9 percent increase from last month. New listings for detached, attached and apartment properties in Greater Vancouver totalled 4,700 in February. This represents a 2.8 percent decline compared to the 4,833 new listings reported in February 2013 and a 12.1 percent decline from the 5,345 new listings in January. Last month’s new listing count was 0.5 percent below the region’s 10-year new listing average for the month. The total number of properties currently listed for sale on the Greater Vancouver MLS® is 13,412, a 9.3 percent decline compared to February 2013 and a 6.4 percent increase compared to January 2014. “With the market continuing to perform at a steady, balanced pace, it’s important for home sellers to ensure their homes are priced correctly for today’s conditions,” Wyant said. The MLS® Home Price Index composite benchmark price for all residential properties in Metro Vancouver is currently $609,100. This represents a 3.2 percent increase compared to February 2013. Sales of detached properties in February 2014 reached 1,032, an increase of 46.6 percent from the 704 detached sales recorded in February 2013, and a 6.3 percent decrease from the 1,101 units sold in February 2012. The benchmark price for detached properties increased 3.5 percent from February 2013 to $932,900. Sales of apartment properties reached 1,032 in February 2014, an increase of 35.8 percent compared to the 760 sales in February 2013, and a 1.2 percent increase compared to the 1,020 sales in February 2012. The benchmark price of an apartment property increased 3.6 percent from February 2013 to $373,300. Attached property sales in February 2014 totalled 466, an increase of 39.9 percent compared to the 333 sales in February 2013, and a 9.9 percent increase from the 424 attached properties sold in February 2012. The benchmark price of an attached unit increased 0.6 percent between February 2013 and 2014 to $458,300.